Exhibitions, Experiments and A Ghost Story! 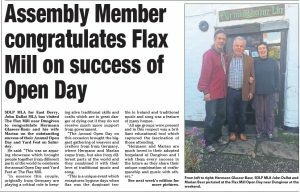 Less than 3 weeks before the 25th Open Day and Yard – Fest, I thought it is appropriate to up-date you on the state of affairs here at Flax – Mill. – Very good exhibition in Upperlands. I had the pleasure to be invited to the opening of a small (maybe too small) but excellent exhibition about the work of Ireland’s oldest linen – mill. Wm Clarks & Son are showing the interested visitor a good selection of what they are manufacturing. Unusual and very thoughtfull in these days of “loft studios”, “creative centres” and galleries to actually present what a factory does! That’s what textile – makers are about and Clark’s creative director Duncan Neil, who put the exhibits together has put the emphasis on products. You will find anything from Clarks new bespoke “Earthed” fabric to linen woven here at the Flax – Mill and finished traditionally (bleeched, dyed, mangeled, beetled….) by Clarks. Also shown are some finished pieces made by ourselves and by master crafters such as Deborah Toner, Jill Gourney and others. A great attempt to bring those who actually make things back into the public’s focus, I would recommend a visit to the Flax Coffee Shop in Upperlands very much. The little cafe/visitors centre is right opposite the entrance to the mill and beside the beetling plant. They are open Tues. to Sat. and alongside the exhibits I strongly recommend the espresso there (10 out of 10). – Linen from Organic Flax sold out but a little bit of good news! Our “experiment” with cloth we wove using yarn (60s lea) which was spun from GOTS certified flax (grown in Holland) turned into more than a success, the cloth sold out to the last inch in less than two weeks! We gathered up all the left-over yarn and have made – last run of weaving before the Open Day – just 100 metres of the 120 g / square metre fabric. Needles to tell you it won’t see the week after our Open Day – let us know NOW if you want any. The growers of the flax have made it very clear that there won’t be any until next summer – a good attitude I think, you just can’t rush nature and the product is so superb that the wait is well worth it. I can aslo give a way a little “secret”: Maria Cardenas, master – tailor from Colombia with a base in Co. Down has purchased some of the wonderful cloth. She will be at our Open Day, certainly prepared to take orders for garments. – Preparations for Sept. 8th are turning “hot” from now on! “All hands on” is a mild way of putting the goings – on at the mill from now on. Bookings are still coming thick but we will put the “cap on” very shortly. The media have taken our press – releases very well and on the day, we will be live guests at BBC Radio Ulster. Also, German radio will be here to report. I would urge anyone who wants to book extra guests, especially for the evening, to do it now!!! As an attachment to this, there’s an incredible story Hermann wrote (no, he says, he only put it to paper). If you have this, you are amongst a lucky few in the world only, who he is wanting to send this to!! After you read it, you may pass it to one or two people as nice as yourself! 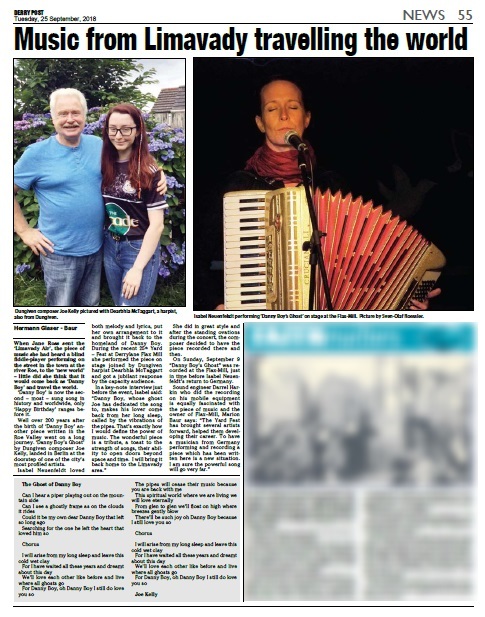 Long time ago a woman – Jane Ross was her name according to the records – watched a fiddle – player in Limavady. He was blind and played a melody she loved. She sent it to the new world and called it “the Limavady Air”. Across the ocean where many emigrants eased their lonely hearts with music from the home words were written to fit the tune – “Danny Boy” was born. It traveled the world, became (and remains to this day) the most sung Irish song – one of the most loved ones too. The origin of the piece in Limavady should not surprise – the area has been one of good music for centuries. The making and playing of harps, fiddles, bodhrans, the writing of lyrics and melodies have a rich and lively tradition along the river Roe – right into the now. A short while ago, Joe Kelly walked the streets of Limavady. It was a grey, dark, ghostly morning. He is a composer, has been creating both melodies and lyrics for many years. The eerie feeling surrounding him, his imagination rambled back in time. He saw Danny Boy’s ghost returning, his lover rising from her grave, called by “the pipes, the pipes”. “Danny Boy’s Ghost” was born. Several singers tried to put their stamp-mark to the piece; it didn’t seem to go far. What was missing? “Maybe it has to travel like the Limavady Air” said a friend. They sent it on the journey across two oceans – a different route though. It landed in Berlin at the doorstep of one of the city’s most profiled artists. Isabel Neuenfeldt loved the piece like Jane Ross had loved the Limavady Air. She knew the setting – had performed in the Roe Valley last year. Her only concert in Ireland ever had created a deep sense of place, a longing to return. 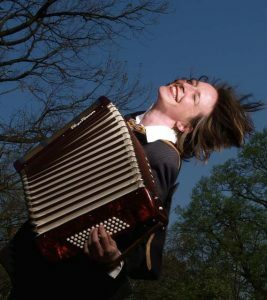 She will – for the 25th Yard Fest at the old Flax Mill in Derrylane – “Danny Boy’s Ghost” in her baggage. 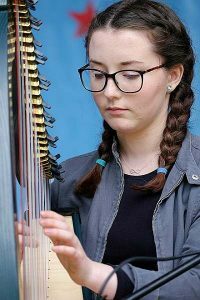 A new found friend will be waiting for her – one who carries on the good old tradition today: 16 year old harpist Dearbhla. 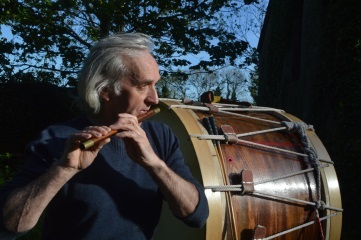 Their performance on the small stage under the oak – trees behind the mill is going to be one of the wonderful pieces which make up the mosaic of the home – land of the “Limavady Air”. I didn’t write this story – just brought it to paper. The place – the annual gathering – the people there and the ghosts of those from the past are the authors. 25th Flax Mill OPEN DAY! Louise Mc Lean is returning! The basket-weaver from Coleraine has no match on this island. Not only will “Northern Ireland’s craftiest woman” put up her beautiful stall – she will demonstrate basket – weaving live and all day. Louise and her products alone would make a trip to the Open Day worth anybody’s while! Jackie Arrell (Magherafelt): Give him a good piece of wood and he’ll turn it into a beautiful item (turn in the true sense of the word!). One of the longest-standing crafters at our Open Day is known to fulfil orders for our visitors from many countries. A great pleasure to have one of the country’s best wood-turners back! Deborah Toner: The Belfast-based embroiderer has been one of the most talked-about and show-cased textile workers in Ireland during last year. Her picture embroidery on linen woven by Flax-Mill is gaining a huge international reputation – for good reason: Her work is spectacular! An Open Day without Brendan Cosgrove is hard to imagine! The metal worker from Co.Antrim will certainly have a large selection of forged and welded one-offs at his stall. He is also demonstrating ring-making from recycled raw-materials such as silver cutlery. 3 spinners working on 3 spinning-wheels – where would you get it? One of the most exciting demonstrations in 2018! Christine, Sarah and another surprise guest will be producing both linen and woollen yarn. We asked them to bring plenty of their top-of-the-range-yarns, they were sold out last year and we predict the same this time! Roe Valley Ancestral Researchers were “new kids on the block” last year their stall promises to be one of the very interesting ones again. The voluntary group with a base in Ballykelly, Co. Derry are aiming to “…research local genealogy” and tell us: “The Roe Valley is so rich in culture yet many visitors don’t know this as there is a distinct lack of information for this area…” Living and working here, we couldn’t agree any more – the RVAR – activists are very welcome guests at the 25th Open Day. Toni Whiteside is one of the real outstanding crafters in Northern Ireland. Toni origins from the Roe Valley and owns the “Abonos” (=Gaelic for bog oak) company. She designs and manufactures most amazing delicate pieces of jewellery from oak which she takes from her bog, one of the oldest in Ireland. The wood (over 8,000 years old!!) is finished with real gold, silver and copper. Toni Whiteside will also supply some pieces for the Fashion Show (see separate leaflet). “Irish Linen and bog oak – a meant to be relationship” (Marion Baur). Sinead Black is returning! The interior designer and lecturer in design at the University of Ulster owns “Bricolage Quilts” studio in Hollywood. She has been very media – present recently, not least due to her bespoke quilts having been short-listed for last year’s “Irish Made” awards. She exhibited in Canada – her linen table ware is now used by top-restaurants like the ever prize-winning “Ox” in Belfast. Ireland’s only female Blacksmith is coming back to make sparks fly! Danna Heron and her father David will stage a large Demonstration with their hand-pumped bellows in the centre. Alongside the working forge they will display classic tools and many items from their workshop. Anything made from iron you could possibly want – if they haven’t got it they will make it for you on the spot. Great to welcome them again! Jill Gourney, Textile – crafter from Aghadowey and owner of “linen lane”, is also returning. Perfectionist work and great designs got the industrious lady into the “designery” in Bushmills. Jill, who uses linen made at Flax – Mill for her work will run a stall and demonstrate how to make a lampshade – great to have her back! Dianne Mc Closkey is a newcomer at our event. Based in the neighbouring townland of Gortnahey she manufactures both Kefir from organic milk and Combucha – tea. Both products are of the highest quality and get a lot of healing – power attributed to them. Dianne, a student of natural science will make for a great addition to our Open Day. Maria Cardenas, 3rd generation tailor from Colombia with a base in County Down will be showing some of the bespoke clothes she manufactures and one of her amazing creations will be on the cat-walk during our fashion show (see separate flyer). Maria calls her products “clothes with simple and subtle shapes”. We call them “simply beautiful” – great joy to have her at the 25th Open Day! John Martin is showing his bespoke clay pots. He will also demonstrate pottery – making while you watch! New to our Open Day, John’s product will cause huge interest. He manufactures according to old designs for pots from this area, some of the patterns are created with strands of flax. Also new to the Open Day is Frank Cammock with a very special book – stall. When his wife Heather gave us a “yes” to model in the fashion show (see separate flyer) we asked him and got a “yes” as well. Frank offers a selection of historic books, literature on the trade union movement and worker’s struggles which is unique in Ireland. He will find a very interested audience at the 25th Open Day! Marta Kocon is one of the finest textile – workers in Ireland. A part – time employee at the Flax Mill she runs her own little manufacturing business as well. Marta often uses a combination of Irish linen and fabric from her country of birth, Poland. She’ll be at the Open Day with a stall full of high – quality treats, many of them made from linen! Needless to tell you that Marion Baur and Liz Corrigan will be running a large stall with both finished products and cloth made here at the Flax Mill as well as some of the amazing garments Liz creates from our fabric. The “mill stall” has become a hub for textile – workers, designers and lovers of good clothes over the last few years, Marion, Liz and their team will be present all day to give advice and welcome new and old friends. Missing the Flax – Mill – stall is like missing the Open Day! Paintings by Margaret Gerhardus on exhibition! Many regular visitors know Margaret as an ingenious soap – maker, her great paintings (shown at many exhibitions recently) are not as known in the North – West. We are delighted to host an exhibition – her pictures will be placed throughout the mill – building. Let her surprise you! Dyeing yarn with natural dyes – a demonstration and talk by Christine Casey! The master – spinner (see above “spinning on 3 wheels”) and owner of “Kiri Cottage Crafts” will not only show spinning alongside Sarah Foster – Jarden, she has committed herself to a dyeing – demonstration and talk. Christine is an active member of the “Ulster Guild of Spinners, Weavers and Dyers” and her wealth of knowledge will attract many interested people – it’s one of those events you should announce your interest in before the day! Darts with N. Ireland Master Travis Baur! 13 year old Travis (he was born here at the Flax Mill) has just won the N. I. masters under 18 for the second time. He will be competing in the coming World Championship in England. Great to have “shooting star Travis” to show and share his skills! Limited places – you must book beforehand for this! 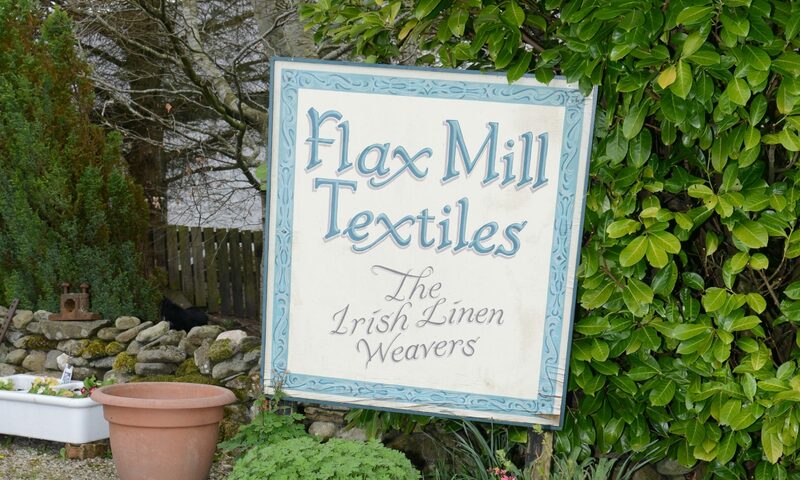 Flax – Mill Fashion Show 2018 – setting trends, not following them! We are producing a separate leaflet with all the details of the Fashion Show (E-mail and hard-copy version). Ask us for this detailed flyer, it will be out from July 10th! Fiona Baur, Annie Press, Heather Cammock and Tony Hiley. Creations in Irish Linen (some in wool and silk) by Marion Baur and Liz Corrigan. 3 Guest – Designers showing one piece each: Chris Tyndal (Loft design, Belfast), Maria Cardenas (see above under stalls and demonstrations) and Fiona Smyth (“Tea and Madeleine”, Limerick). Jewellery and accessories by Ruth Walker, Toni Whiteside and Marta Kocon. 1 showing only @ 1 pm in the marquee! Limited spaces and a strictly “first come first take” policy – it’s the only fair way to organise this capacity – show. Please book your place as soon as possible! “Earthed” the world’s most unusual fabric at the Open Day! Insiders know that Flax Mill is stockist and promotes “earthed”, the digitally printed linen, a brand-new product by William Clark, Upperlands. The brain child of Clark’s creative director Duncan Neil who will be at our Open Day was originally designed for home-interior and upholstery – still is that but has found another spectacular use: German tailor Georg Bünger, while doing work-experience at Clarks, made a jacket from one of the designs. It will be first – time shown during our fashion show! We guarantee you: You have not seen a garment like it! Who else What else Who else What else? Homemade cakes – locally roasted coffee – a good drop of tea – the best of crack! Classic and vintage cars galore – Ireland’s oldest commercial vehicle on the road – old machinery – the only surviving hand – breaker for flax in operation…. All our weaving looms operating all day, tours of the mill! Guests from all over the world, no strangers, just friends you have yet to meet! -Ireland’s best session after the gig! 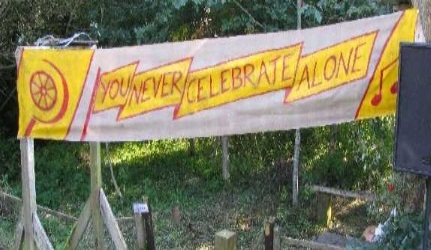 Open Day and Yard Fest are private events – the owner reserves the right to refuse admission at all times. There is no entrance fee for the Open Day, for the evening concert, dinner etc.…you need an invitation, ask us for details. For all details, hard-copies of the programmes etc. contact the mill at above number, Hermann deals with the bookings.